Creating Learners Profile - With this process I am able to affirm myself in what I know about the learners and gathering evidence that helps me paint pictures them. The learners' helped me in creating their profile. We conducted a project - HOW ABOUT ME. With this project, the learners has to write an AUTOBIOGRAPHY of themselves. They write a BioPoem of themselves. They interviewed their parents about their expectations for them as their children. This was a great eye opener. Some of the responses were vague and parents were not too sure of what they expect of their children. 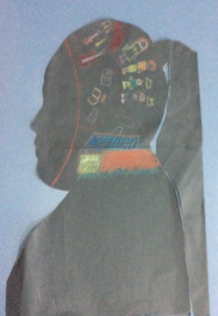 Through art, learners create a silhouette portrait and drew what are the most important things for them - at least 5. Again this activity provide an opportunity to see through the eyes of my learners. My challenge is - How can I build on what my learners have? One of my learners' art work.